elmex offers a wide variety of Power / Bus-Bar / High Current Terminals suitable for all types of cables (solid, stranded, with fork type and ring type lugs) both in Polyamide 66 and Melamine Housing. In the Feed Through Range, Terminal types KUT25, 35, 50 and 95, with respective rated currents 101, 125, 150 and 232 Amps are available for connecting solid and stranded conductors. 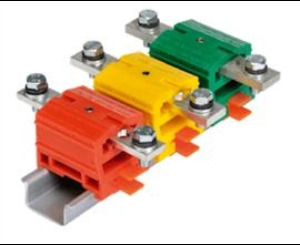 Power (Bus-Bar) Type terminal range covers DPBB50, 70 and 120, rated upto 269 Amps, for fork/ring type lugs, bolted to the current-bar of the terminal block. Protection and Safety For increased creepage distance and safety against accidental contact, partition plates / barrier plates are assembled along with the terminal block. Protective transparent covers are assembled at the slots provided on the barrier plates. This provisions make the assembly fully safe, while simultaneously offering open design of terminals for connection fork / ring lugged cables.